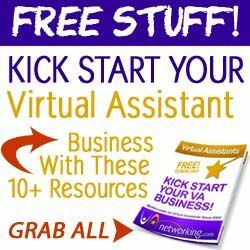 We think you’ll find this to be a useful site to advertise at since we have such a loyal group of Virtual Assistants and small business owners. Our visitors are interested in products and services that are helpful to small business owners, virtual assistants, work at home moms, networking, software and other computer related areas. Our message board forum is very active and is the largest in the VA world with over 50,000+ registered members. It is an ideal website to advertise on if your product or service falls within this market of virtual assistants and small business entrepreneurs. Bring traffic to your website, increasing your profits by advertising with VAnetworking . Our Certified Internet Marketing Specialist, Tawnya Sutherland of Mediamage Business Solutions, strives to constantly keep our website in the top 5 of the search engines for many keywords related to virtual assistants and small business entreprenuers. All banners ads and advertisement are subject to approval by VAnetworking. Advertiser banners are in hierarchical order at VAnetworking based on a first come, first serve basis. The higher up you are on a webpage means that you’ve been advertising longer with us than the banners below you. We thank advertisers for their continued loyalty and give preference to them by ranking them higher. If you cancel your advertising or do not renew it, you do down to the bottom of the page. Download our Advertising Spec Sheet for pricing. The VAnetworking website ranks top 5 in major search engines for over 200+ keywords related to small business startups, business networking, work at home opportunities, virtual assistant, virtual assistance, etc. and is managed by a Certified Internet Marketing Specialist. We also hold a Virtual Assistant Conference twice a year online that sells out every time. Sponsorships are available for this event and you can learn more here. All banners must be within 6-10K in size and include no flash or animation. Only static banners will be accepted. If you don’t have a banner, we can prepare one for you. Our web graphic designers will work with you to prepare a banner according to your needs, and will provide helpful suggestions for getting the most exposure for your business. (The banner is yours to keep with all rights given to you).